Headquarters for this exciting event is Whatuwhiwhi, a mecca for kite fishers. It is located on the Karikari Peninsula at the head of Tokerau Beach, eighteen kilometers of sweeping unspoilt white sands extend to the south. It is a great kite fishing spot for snapper, gurnard and kahawai whenever the wind blows from the west. If it blows from the east it's just half an hour from to the famous 90 Mile Beach. It will be a great way to meet fellow kitefishers, exchange ideas and techniques, see novel winch inventions and to catch some good fish. Remember it will be schooling season so there'll be plenty of snapper around. Thank you very much for the demo of the new mega air kites, you have definitely strengthened my resolve to upgrade my kite gear as soon as possible. The performance of the mega air 3 in what were truly marginal light air conditions was amazing. I can't wait to see the new range of inflatable casting kites. Look forward to attending the next demo, thanks guys. Peggy and I arrived at Orewa Beach at 11.30am, a very light breeze was blowing. The wind was swinging between southerly to south south west. It varied from around 40 to 70 degrees offshore and was to swing back and forth all day. We launched the new inflatable Mega Air 3 Kite and it took us four attempts to get the tack just right in the variable conditions, and to understand how big an arc the wind was swinging through. As far as fishing light winds, this was about as marginal as it gets. The required right hand tack was achieved through shortening the bridle on the left hand side of the kite, see Tacking Instructions for more details. 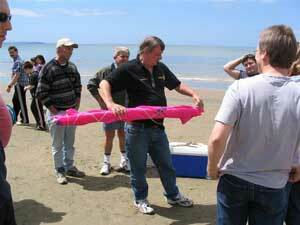 When the kite went into the sea it was recovered easily on the surface, the tack was quickly readjusted and the kite given a shake to remove a little of the sand and excess water before being immediately relaunched wet. As it soared back up I let the line slip through my fingers while letting the line grab a little, this made the kite vibrate like a drum and shed any remaining water or sand, much like a dog does after a bath. After setting up the big rig I put up a small inflatable on a 24kg rig before going up the beach to chat with another kitefisher who was setting up a Mega Air 3 on a longline. Peg stayed with the big rig and is convinced the wind dropped to less than two knots for about twenty minutes during which time the kite lost altitude but was saved from going in the water by pulling in about 60 metres of line when the kites' altitude dropped to about 50 metres above the sea. Even is the light winds the kites were simple to launch and flew straight up first time. Incredibly the Mega Air 3, which has three times the sail area of a delta super kite, weighs less. Even though the winds were extremely light the 2 litre float half full of sand was occasionally being lifted clear of the water. Everyone who attended the demo was very impressed with the light wind performance of the kites. Boaties I have spoken to who were out in the area describe Sunday as "flat as a millpond" and struggled to believe that we had actually kitefished in such calm conditions. A kite fisherman further up the beach tried to launch a delta kite and skyhook but failed to keep the kite in the air through the frequent lulls and eventually gave up. I am convinced that no other fishing kite could have flown in these conditions. Kite fishers in light wind areas like the Bay of Plenty will get the most benefits from the Mega Air 3 kite as they will be able to successfully fish many more of those marginal light wind days, which are common in the area, with the new inflatable fishing kites. The graph on the left shows the average wind speed at the Massey Weather Station and clearly demonstrates how flukey the breeze was around the time of the demo. As these are averages, that means that half the time the wind was less than what is shown and half the time it was stronger. The strongest gust recorded between 10.30am and 2.00pm was 10.8 knots (Gusts and lulls are not shown on the graph). Those attending the demo on the beach experienced many lulls when no perceptible wind blew on the beach and no movement could be detected in the leaves of nearby trees. The kite was flown at an altitude of 400ft the maximum allowed under the aviation regulations. The Paul's Fishing Kites inflatable kites won first place at the New Zealand kite fishing clubs' annual inventors evening. 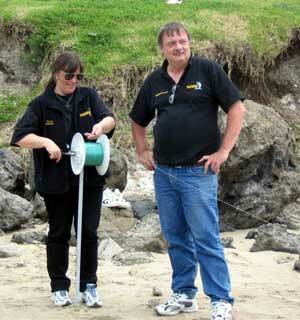 We arrived at the beach just after Paul and Peggy had the kites up and the gear was being set. The Mega Air 3 kite was attached to a standard dropper rig. I picked the wind to be about 4-5 knots gusting up to 10 knots. The kite went out at a slight angle but almost straight out. What was amazing was the pull generated by the kite in such light conditions. There were 22 hooks on the rig and the kite had no trouble taking the gear out at walking pace. While we waited for the gear to set, Paul launched a smaller version of the inflatable kite on his rod and reel. This went up no trouble with no tack and could easily have pulled 5-10 hooks out on the day. 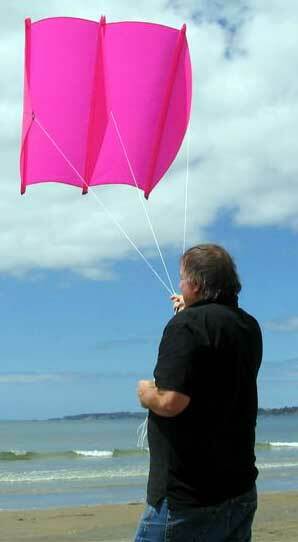 Paul thinks this kite will eventually be a substitute for the flexi-wing. It looked great in the light conditions. Paul reminded us not to over inflate the bladders on the inflatable kites as this could reduce the kites efficiency in light winds. This was what Paul thought may be happening with a fellow kite fisher down the other end of the beach who was launching a Mega Air 3. Paul went and assisted this fellow who was operating a long line and found it was simply overtacked and the kite was soon at full altitude once this was sorted. The winds were so light I personally was doubtful that he would get his longline out with 25 hooks on, but before long the kite had pulled the longline 1000 metres offshore. The chap was pleased with the performance of his inflatable kite, it was only the second time he had used it. Eventually, his kite did disappear in to the water, but that was probably because the wind had dropped to zero, and I think he was too busy talking to curious people like me to notice the kite was losing altitude! Back to Paul's kite - when the wind did drop off Peggy allowed the kite to come down to within 50 metres of the water while hoping a slight puff of wind would catch the kite and allow it to climb. It took about 20 minutes for the kite to slowly lose altitude but only three short pulls on the mainline of about 20 metres each to get the kite straight back up without any problems. Unfortunately, no fish were caught either by the dropper line or by the longline and I believe this was because there were simply no fish around, none of the baits had been touched. Never mind, I had seen enough to give the thumbs up to the new kite!!! Thanks Peggy and Paul for an enjoyable few hours on the beach. 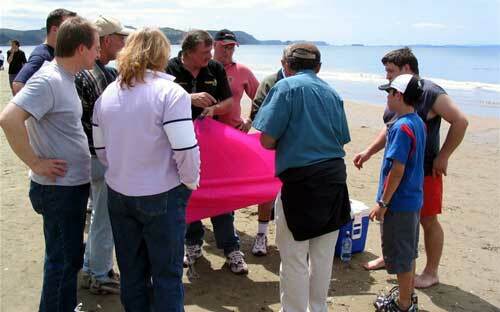 We have found a new kite fishing possie at Cornwallis Beach which can be fished in northerly quarter winds. We found the easiest place to launch from is the bottom end of the carpark, (the end furthermost away from the wharf). When we got there, both Aaron and I agreed that this looked like a very good place to fish as it seemed to have that X-factor look and feel about it. While I was pulling the gear out of the car, my husband rung the Onehunga wharf terminal services to find out what times and tides the ships leave and enter the harbour. They said that it was used by bigger vessels only around around high tide as this was the safest time for them to navigate the shallow, narrow channels. So we were all right, we had arrived at dead low tide and we fished until the tide was three quarters in, there was no possible way we could lose gear due to a ship running across it. The fishing was quite good as we only had to go out about 400-600 metres to reach the channel. 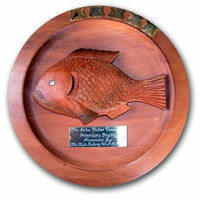 We caught an array of fish from average size kahawai to really nice size gurnard and some excellent size trevally. We also took the dog as this area seems to be very kind to people, dogs and kids. There is a park ranger on site who stops any trouble from happening and also checks the size of your fish and your bag limits. This is a DOC park and there are flush toilets, drinkable running water, plus gas and wood burning bbq's free for use. There is a big sign saying "Dogs welcome" on leash only and you must clean up any mess they make. All in all, it was a bloody great day! Windy, but good. Just thought we'd let you know.